In early November, while celebrating the 150th anniversary of the birth of Metropolitan Andrey Sheptytsky, Ukrainian Prime Minister Arseniy Yatsenyuk proclaimed that “the Ukrainian army has been fighting and winning for 20 months.” This was a startling announcement for the head of a government which has lost pretty much everything that it is possible to lose due to lack of professionalism and stupidity. 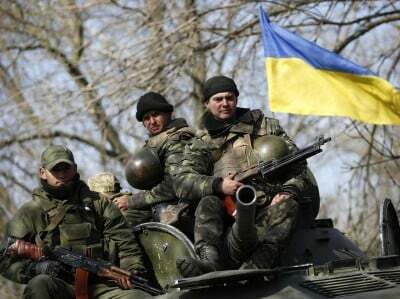 Taking a look at the dry figures – the armed forces of Ukraine currently consist of 188,000 troops. Over the past year the number of generals has risen by 60% – from 121 in 2014 to 201 in September of 2015. In other words, the Ukrainian army now has one general for every 935 soldiers. What tangible successes have we seen from this intellectual machine that grows more bloated each month? During the conflict in the Donbass, Ukraine lost about 24,000 soldiers in combat operations, almost 54,000 were wounded, and over 9,000 have gone missing. Deaths from non-combat-related fatalities totaled 1,309, including 873 suicides. Over 3,000 pieces of basic military equipment were utterly destroyed, and another 2,000 items were seized by the armed forces of Novorossia as spoils of war. Destroyed were 929 battle tanks of various types, 887 AFVs, 238 BM-21 Grad multiple-rocket launchers, 836 vehicles, 21 military jets, 32 helicopters, and 46 UAVs. A total of 2,500 soldiers were taken prisoner during the fighting, most of whom were later turned over to relatives or exchanged. But the hostilities did not always progress in such a way as to justify such examples of panic and surrender. For example, in August 2014 near the city of Ilovaisk, the commander of the southern operational command unit, Lt. Gen. Ruslan Khomchak, ordered his troops to break through the fortified positions held by the rebels, while personally escaping the area in the opposite direction. The general even abandoned his personal driver, who had been wounded. Nearly a thousand Ukrainian soldiers died that day. It was no surprise that Major General Viktor Nazarov, who was at the time the Chief of Staff of the Anti-Terror Operation (ATO), claimed that mass desertions began taking place soon thereafter. 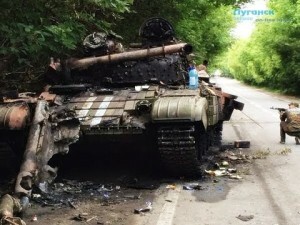 The military prosecutor’s office of Ukraine has launched an official investigation into 16,000 cases of desertion from the “zone of the ATO,” as well as 6,000 cases of failure to follow orders (the majority are against officers who refused to carry out suicidal orders and tried to pull their troops out of these “cauldrons” – or areas where they were encircled by enemy forces – in order to minimize casualties). In the end, about 7,000 criminal cases were opened against men who were eligible for the draft but evaded their mobilization orders. The celebrated 24th Mechanized Brigade, created in the city of Yavoriv in Western Ukraine (now home to NATO instructors and trainers), was on the verge of disbandment after repeatedly being trapped in tactical encirclements in the East and suffering heavy losses. Corruption, theft, and a lack of supplies are just the cherry on the sundae of the Ukrainian army’s self-destruction. Four million hryvnia ($160,000) was embezzled by just a single head of financial services within the Ukrainian armed forces, Major Andrey Kvirel, which he took from the soldiers’ military pay. This amount was enough to have supported an entire regiment in the “Anti-Terror Zone” for four months. Finally, Ukraine has virtually no air force or navy, and billions of hryvnia have been pumped into the construction of meaningless fortifications on the Russian border. If this is what Prime Minister Yatsenyuk calls “victories,” then what would he consider a military fiasco?